40 | TH E M R EP O RT O R I G I NAT I O N S E R V I C I N G DATA G O V E R N M E N T S E C O N DA R Y M A R K E T ORIGINATION THE LATEST Mortgage Performance Continues to Improve An OCC report shows nearly 95 percent of mortgages are current. O verall mortgage per- formance continues to improve, accord- ing to the Office of the Comptroller of the Cur- rency's (OCC) Mortgage Metrics Report for Q 4 2016. The report, released in late March, showed 94.7 percent of mortgages were current and performing at the end of Q 4 2016, compared with 94.1 percent a year earlier. The OCC reported that banks serviced approximately 19.8 mil - lion first-lien mortgage loans at the end of Q 4 2016, with $3.45 trillion in unpaid principal bal- ance. In addition, servicers initi- ated 45,495 new foreclosures in Q 4 2016, a decrease of 5.1 percent from the previous quarter. Home forfeiture actions, in total—includ - ing completed foreclosure sales, short sales, and deed-in-lieu-of- foreclosure actions—decreased by 32.3 percent year-over-year. Foreclosures have been on a decline since at least Q 4 2014, according to the OCC report. The number of completed foreclosures dropped from two years ago by almost 19,000, while deed-in- lieu-of-foreclosure actions have dropped from 1,200 to 800. Newly initiated foreclosures dropped from 75,400 in Q 4 2014 to 45,500 at the end of Q 4 2016. According to the OCC, loan modifications decreased in Q 4 2016, from 35,642 in Q 3 to 32,312 loan modifications in Q 4—a 9.3 percent decrease. More than 93 percent of these modifications were "combina - tion modifications," or modifica- tions that included multiple actions affecting affordability and sustain- ability of the loan. The remaining 6.7 percent were not assigned a loan modification type. Of the 32,312 modifications, 89.3 percent successfully reduced the loan's pre- modification monthly payment Of all 50 states, Texas experi - enced the most total modifica- tion actions at 2,728, followed by California at 2,678. 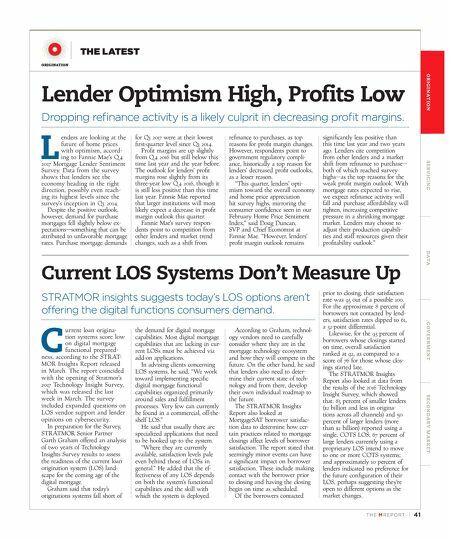 The OCC's report covered first-lien mortgages and excluded junior liens, Home Equity Lines of Credit, and Home Equity Conversion Mortgages (reverse mortgages). Alternative Credit Scoring Could Expand Mortgage Pathway Some lenders are issuing low- balance credit cards to previously unscorable borrowers. W hether it's in California or Alabama, young families are hav - ing trouble obtaining a mortgage for their first home. A blog post from the Urban Institute by Ellen Seidman asked, "can new scoring models, or data about rent and utility payments, help these fami- lies become homeowners?" Representatives Ed Royce (R-California) and Terri Sewell (D-Alabama) discussed the dif- ficulties their constituents have in obtaining a first home at an Urban Institute event. For one, the Representatives said, the raditional credit scoring system does not serve the needs of homebuyers—espe- cially young buyers. 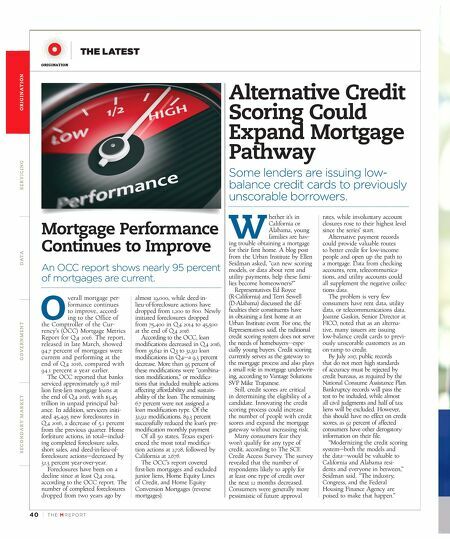 Credit scoring currently serves as the gateway to the mortgage process and also plays a small role in mortgage underwrit- ing, according to Vantage Solutions SVP Mike Trapanese. Still, credit scores are critical in determining the eligibility of a candidate. Innovating the credit scoring process could increase the number of people with credit scores and expand the mortgage gateway without increasing risk. Many consumers fear they won't qualify for any type of credit, according to The SCE Credit Access Survey. The survey revealed that the number of respondents likely to apply for at least one type of credit over the next 12 months decreased. Consumers were generally more pessimistic of future approval rates, while involuntary account closures rose to their highest level since the series' start. Alternative payment records could provide valuable routes to better credit for low-income people and open up the path to a mortgage. Data from checking accounts, rent, telecommunica - tions, and utility accounts could all supplement the negative collec- tions data. The problem is very few consumers have rent data, utility data, or telecommunications data. Joanne Gaskin, Senior Director at FICO, noted that as an alterna - tive, many issuers are issuing low-balance credit cards to previ- ously unscorable customers as an on-ramp to credit. By July 2017, public records that do not meet high standards of accuracy must be rejected by credit bureaus, as required by the National Consume Assistance Plan. Bankruptcy records will pass the test to be included, while almost all civil judgments and half of tax liens will be excluded. However, this should have no effect on credit scores, as 92 percent of affected consumers have other derogatory information on their file. "Modernizing the credit scoring system—both the models and the data—would be valuable to California and Alabama resi - dents and everyone in between," Seidman said. "The industry, Congress, and the Federal Housing Finance Agency are poised to make that happen."